In spite of the fact that many Americans are still feeling the headache, nausea, and exhaustion from the Not-So-Great Recession, it looks like we’re becoming more responsible about paying our loans on time. According to a new report, the delinquency rate on bank-issued credit cards is now at its lowest since 1994. The folks at the American Bankers Association have released their latest Consumer Credit Delinquency Bulletin, which you probably guessed from the on-the-nose title is a look at how consumers are doing at paying back a variety of loans. 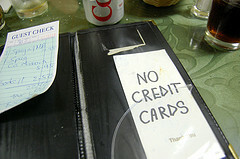 In general, the news is positive, especially with regard to credit cards. The ABA saw a drop in delinquencies on bank-issued credit cards from 2.75% to 2.47%, an 18-year low and significantly better than the 15-year average of 3.87%. Similarly, there was a drop in the delinquency rate from 1.93% to 1.85% on home equity lines of credit, while the ABA saw a slight an increase in non-card revolving loan delinquencies from 1.28% to 1.31%. The ABA report also looked at eight categories of closed-end loans and found improvement in delinquency rates in four — personal loans, indirect auto loans, property improvement loans, and home equity loans. There were slight increases in delinquencies three closed-end loan types — direct auto loans, mobile home loans, and marine loans — while the rate for RV loans remained unchanged. These upticks were comparatively smaller than the decreases in other categories. The ABA says the overall index of these eight categories shows a 1.99% delinquency rate, well below the 15-year average of 2.39%. ABA chief economist James Chessen says this is the first time in more than a year that there have been declines in the three home-related loan categories – property improvement loans, home equity loans and home equity lines of credit. But don’t break out the streamers and party hats just yet. There have been signs, omens, tea leaves, silver linings, and crystal ball readings predicting an eventual end to the financial doom and gloom since it all started.